New Gettysburg regimental-level scenario book! Talented wargame scenario designer Brad Butkovich is among the upper echelon of today’s generation of Civil War regimental-level wargamers. The Georgia-based Butkovich is well known to Charge! readers from his previous series of excellent scenario books, mostly based upon battles in the Western Theater. Now, Brad has produced an interesting new booklet covering various actions at the July 1-3, 1863, battle of Gettysburg. It’s an area of keen personal interest to me! Some of you may recall a two-volume set, Enduring Valor: Gettysburg in Miniature, which I wrote for my friend and graphic designer Ivor Janci more than a decade ago. They have long been out of print, so Brad’s fresh look at the battle is much appreciated and timely. Here is the table of contents for this book, which may be the first in a series (let’s all hope!). Brad’s research is compelling and accurate, and his take on how to break up the battlefield into bite-sized scenarios is of strong interest to Civil War gamers everywhere. The scenarios are adaptable for almost every major regimental-level rules set. They are designed for 15mm gaming, but of course can be modified for other figure scales. Brad also presents data for rules based upon 10-minute, 15-minute, and 20-minute time intervals per turn. 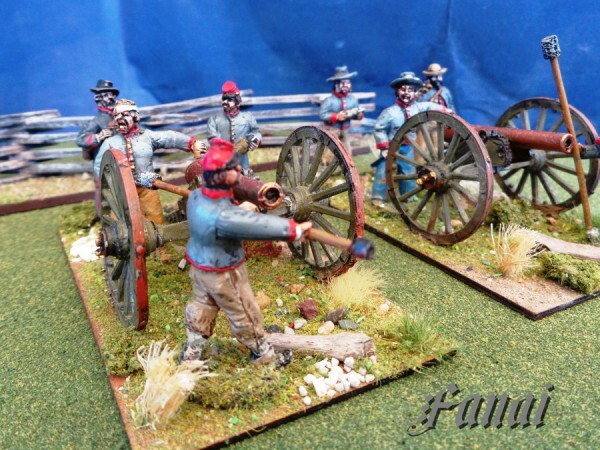 A reader sent me this image of an old Confederate artillery diorama (25-28mm it appears) he purchased in the 1980s. It is hand-painted with excellent detail and is hand-signed “Wilson” in white ink on the lip of the hardwood base. Does anyone know anything about this piece, especially the identity of “Wilson”? What about the figures? Any idea of the manufacturer? Combining Undying Courage scenarios into one large ADF table! 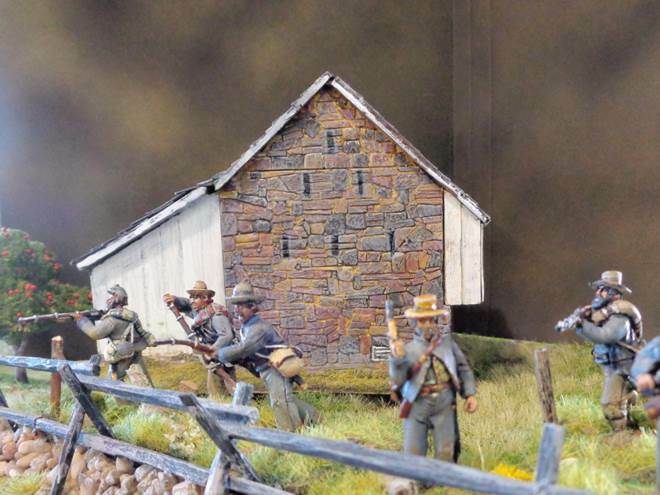 Years ago I wrote the text for a very popular wargaming scenario book, Undying Courage: Antietam in Miniature, which has unfortunately been long out of print. 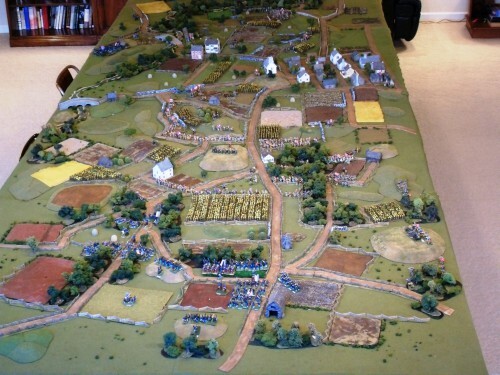 Long-time Johnny Reb wargamer Jerry Merrell has taken several of my scenario maps (drawn by graphic artist/publisher Ivor Janci of Wheaton, Illinois) and combined them into one large tabletop layout of Antietam for a heavily modified version of the late John Hill’s Across a Deadly Field rules. Check out his layout above! Impressive! More 40mm ACW from Brad Smith and Ian Fainges! Australian wargamers Brad Smith and Ian Fainges are back with some more photos of their great 40mm American Civil War wargaming layouts. Inspired by Karen Rodes’ McPherson’s barn I presented in a past Charge! 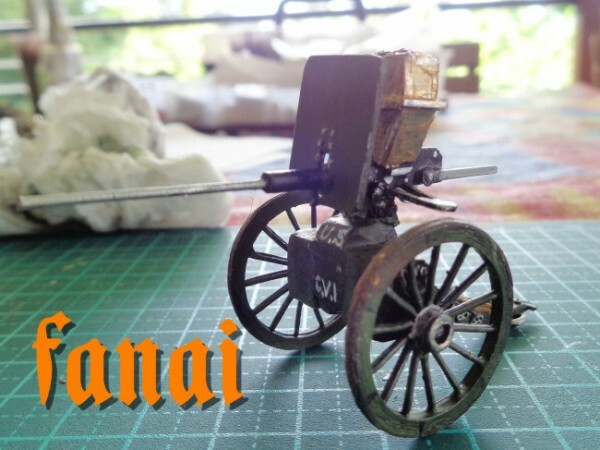 blog post, Ian decided to customize another building and partially scratch build his own 40mm version of this historic structure on the Gettysburg battlefield. Nice job, isn’t it? The guys played their first ever 40mm ACW wargame a few weeks ago (Brotherton FIeld at Chickamauga). Here are some photos! 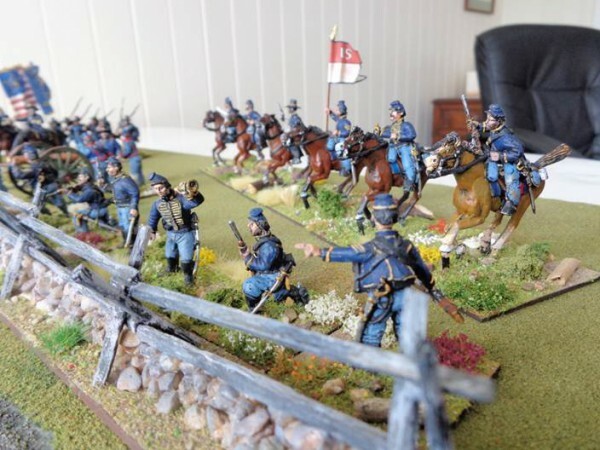 Gettysburg, Pennsylvania, resident Karen Rhodes is a crafter and modeler. 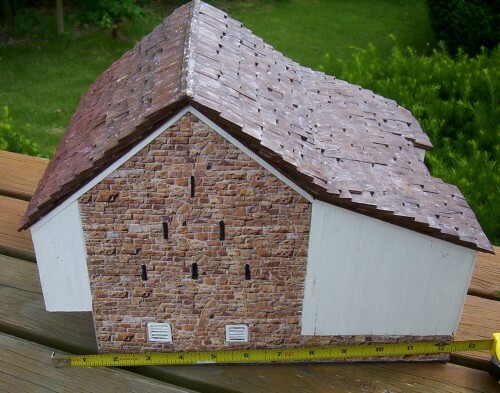 Recently, she has begun scratch-building custom-made wargaming buildings, including this 28mm wonderful rendition of McPherson’s barn, a prominent landmark on the first day’s battlefield west of town. Here are some more of her photos of the 28mm McPherson’s barn. Newly painted 40mm ACW figures from Brad Smith and Ian Fainges! Australian wargamer Ian Fainges has given me permission to reproduce some of his images on Photobucket of his 40mm Civil War figures. Of particular interest is this scratch-built so-called “coffee grinder” machine gun, a device which saw limited use on the battlefield during the war but was a technological advance which with other similar weapons such as the Gatling gun eventually led to the development of the machine gun. Some fifty years after the Civil War, machines guns played such a horrific role in the trench warfare of World War I. Here are some of Ian’s other photos. A few years ago, I spent a delightful morning touring the first day’s battlefield with Australian wargamer Brad Smith and his charming wife, Judy. We all had fun, and it was neat to talk about our mutual hobby of wargaming the American Civil War over lunch after the battlefield tramping. Brad and I have stayed in periodic contact since that 2012 morning, and he recently sent me several photographs of his 40mm ACW collection. Brad’s friend Ian Fainges “spruced up” some of the figures to augment Brad’s painting. Ian also took the photos which appear on this Charge! blog entry. The figures are 99% Sash and Saber and 1% Foundry. The flags are from The Flag Dude, a popular U.S.-based producer of high quality customized flags. Here are several more of those photos. Nice work, lads! 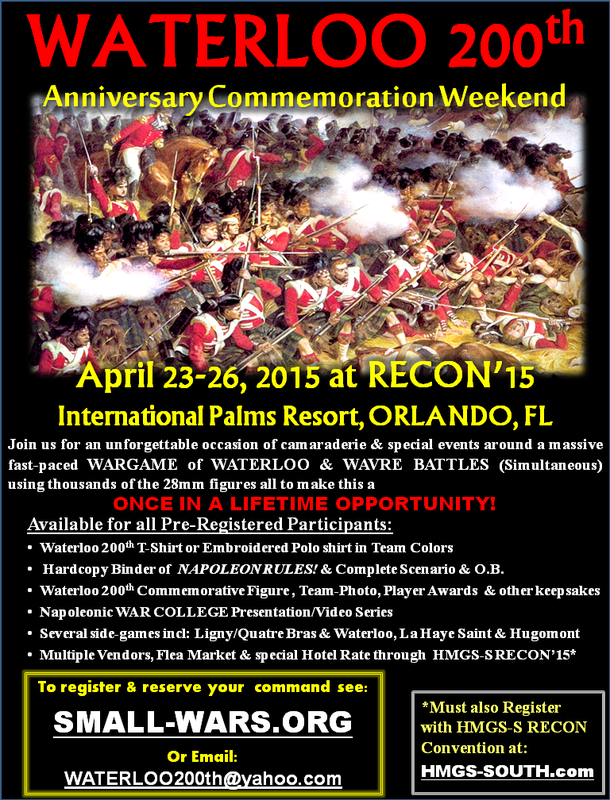 Special Waterloo 250 Anniversary Wargaming Weekend! Guest blog post from my friend Pete Panzeri! Click on the above image to enlarge it for easier reading. It’s going to be REALLY NICE down here in FLORIDA! It will be WELL worth the trip! Talented game master and author Brad Butkovich of Historic Imagination is back with another regimental-level Civil War scenario book for use with popular miniatures rules sets. Brad is an excellent researcher with a number of similar scenario books in print, as well as non-fiction Civil War books such as his outstanding account of the 1864 Battle of Pickett’s Mill in Georgia. He has become one of the leading experts on wargaming the 1863 and 1864 fighting in northern Georgia and Tennessee. His previous works have covered the battles of Chickamauga and Pickett’s Mill in detail with various scenarios per battle. 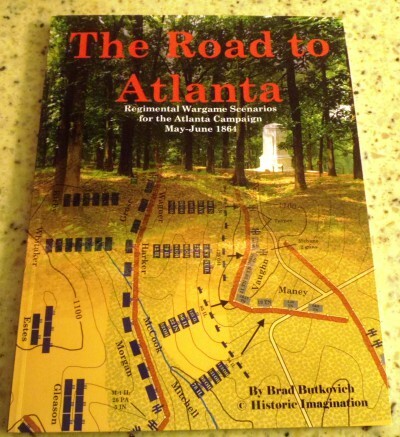 This newly published book is entitled The Road to Atlanta: Regimental Wargame Scenarios for the Atlanta Campaign May-June 1864. It is roughly 100 pages chock full of interesting scenarios which can be used as base information with modifications for Regimental Fire & Fury, Across a Deadly Field, Johnny Reb, Gettysburg Soldiers, Civil War Commander, and several others. Brad offers scenarios for Crow Valley, Stevenson’s Attack, McPherson at Resaca, Lay’s Ferry, Gilgal Church, Latimer Farm, Noonday Creek, Bald Knob, Pigeon Hill, and Cheatham Hill. Each one includes a full order of battle for the opposing forces (including organizational structure, manpower, and armament), an excellent map drawn by Brad, historical commentary, scenario-specific objectives and special rules, terrain details, objectives, and victory conditions.